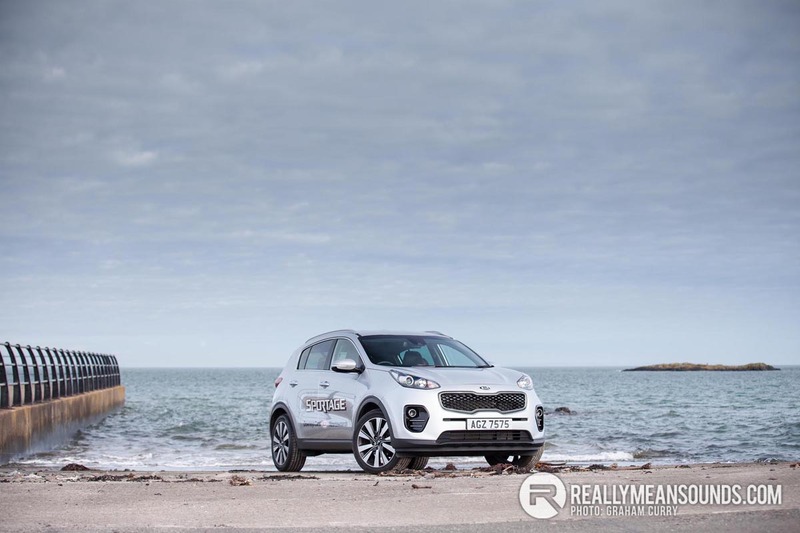 Kia has definitely come a very long way in regards to the overall build quality and products used in the cabin over the last few years and when arranging to test the all new Kia Sportage for a weekend review I was quite excited to see if it fulfilled the high standards set by the Sorento. 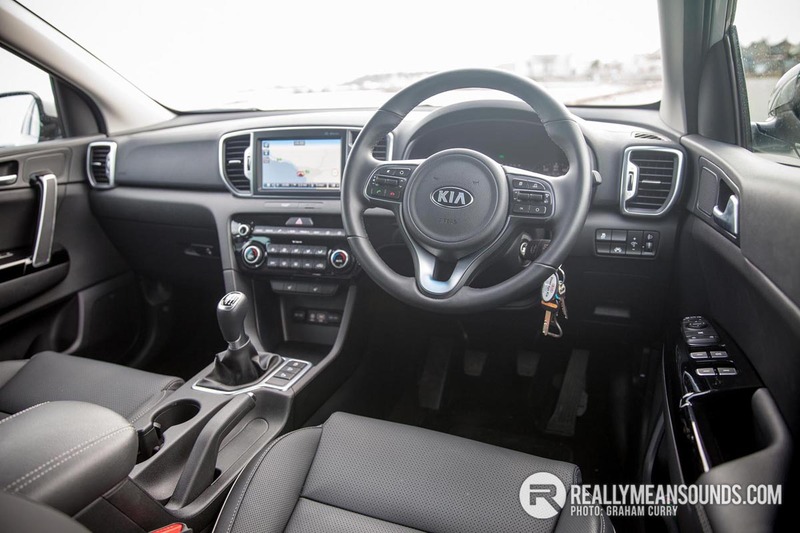 We reviewed the latest Kia Sorento recently [read our full review here] and it was more than impressive with specification and price very favorable in the seven seat SUV category but the quality is what impressed the most. 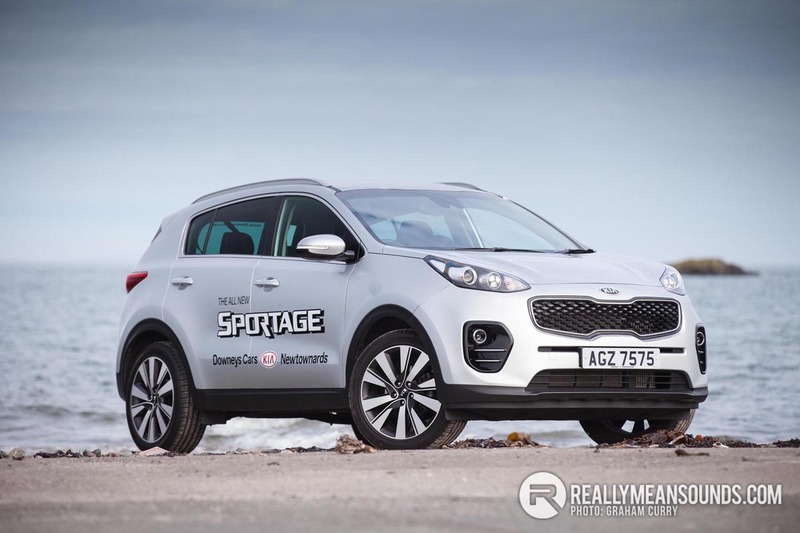 I have spent a little time in the outgoing Sportage and I will admit, it was a nice place to be, however over time it started to look a little dated and with technology and styles within the automotive industry moving so quickly, this all new model has been timed perfectly. On arrival at Downey’s I was greeted by this lovely metallic silver Sportage sitting in the forecourt and after a quick introduction to the car I set off for a busy enough day on the road. My first impressions of the new Sportage were positive. It’s a fresh looking vehicle with three funky looking DRL LED’s in the middle of each front light cluster, quite a trademark thing for the Sportage and most certainly thinking outside the box from Kia. The open mouth grill is a design choice that a lot of manufacturers seem to be implementing in recent years, the Kia is no exception and the open mouth front end looks great. Around the back there is quite a large spoiler accompanied with black side fins on the rear glass which suits the car perfectly and gives it the sports look, whilst mentioning the glass, this Sportage comes with rear privacy glass as standard. Overall the Sportage looks a lot smaller on the road and in person than it actually is and the way its styled makes its true size deceptive. Opening the tailgate revealed a decent sized boot offering plenty of space and a removable floor; expandable height is a very usable feature, combined with split fold rear seats offering enough room to swallow a trip to a well-known Swedish home ware store possible. 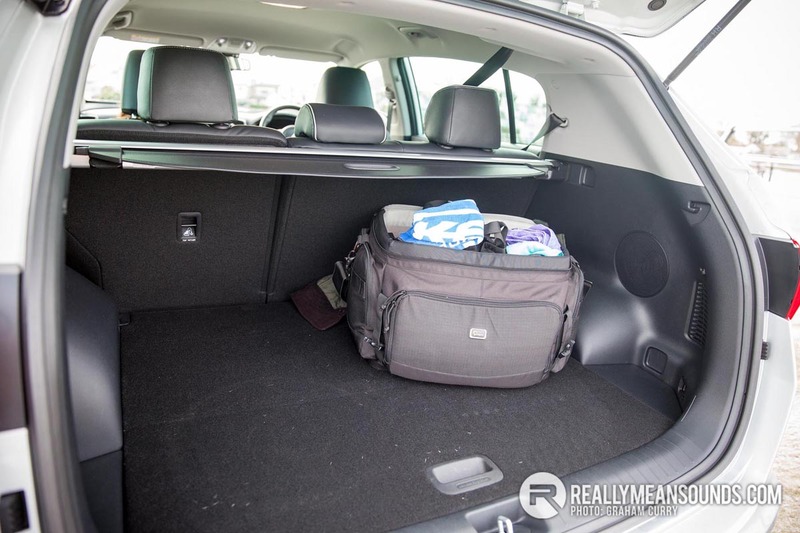 Inside the Sportage was lovely and instantly noticeable were the heated, perforated leather seats front and rear with the outer most rear seats even being heated. White piping and stitching around the upholstery was a nice touch and the seats overall were very comfortable however for me personally a bit more bolster support would’ve been welcomed. The dash layout was perfect and despite having what seemed like a lot of buttons, it was very easy and simple to see what was what and get used to all of the controls whereby they no longer looked like a mass of switches, nor confused me. The rear of the Sportage offered plenty of head and leg room, which would be ideal for family life with very young children right up to providing safety and comfort for both adults and teenagers, even on longer journeys. 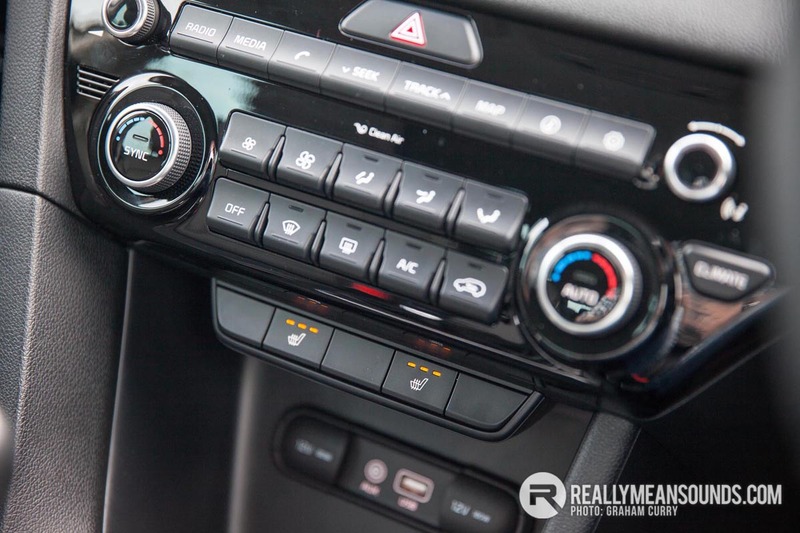 Infotainment is something that pretty much all cars come with in abundance as standard these days and the Sportage was set to keep that trend alive and kicking with Aux input, DAB Radio, Bluetooth, USB input etc as well as Sat Nav, all through the perfectly sized 8″ screen. Within the speedometer cluster in the dash is another screen, this time a 4.2″ one which is full colour and will help guide you with sat nav instructions as well as giving you plenty of car data and great integration with the infotainment system. Sound quality was fantastic and was provided via a JBL premium audio system from factory on this spec level car which is a Sportage 3 Sat Nav. The quality is helped with a front centre speaker, amplifier and even a subwoofer. Engine wise there are a few options with the new Kia Sportage with two petrol’s on offer, a 1.6 GDi 130bhp engine which is available on the two entry level cars and comes only with a six speed manual gearbox whilst on the range topping GT-Line Sportage you have the choice of the 1.6 T-GDi petrol engine with either a six speed manual or seven speed DCT auto, both of which provide a fantastic 174bhp and are also both all-wheel drive. Kia also have a few more choices for the diesel owner with the 1.7 CRDi available on the Sportage 1,2,3,4 models producing 114bhp with only a six speed manual gearbox. This is the engine that was on our model tested and over a hundred or so miles of mixed driving was returning mid-forties mpg. It pulled well and would definitely fulfill most owners’ needs. Personally for me though, as a driver who would do large miles on very mixed roads, I would go for one of the two 2.0 diesel engines on offer, firstly there is a 134bhp model equipped with a six speed manual which is available in the Sportage 1,2,3 models with the latter two having a six speed auto option. This engine is also available on the GT-Line Sportage with all-wheel drive and in manual or automatic transmission format. The other diesel engine is an 182bhp variant and is available in manual or automatic on the Sportage 4 range with the Sportage First Edition getting this engine with an automatic gearbox only. 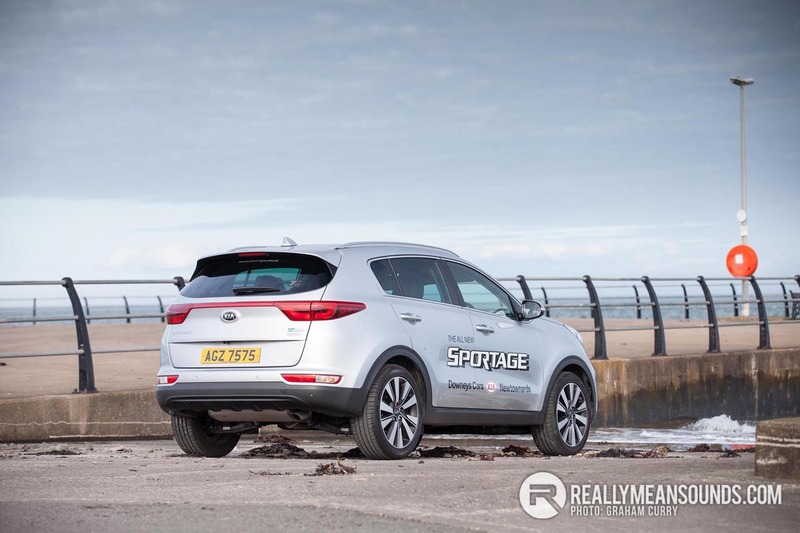 When driving, the Kia Sportage is very smooth indeed and although the steering was a slightly too light for me personally it handled well with minimal roll and was pleasant to drive and felt more than safe despite the roads I took it on. With pricing for this test model coming in around the mid £20k mark it’s certainly a great value for money SUV capable of carrying five people with comfort along with a couple of dogs in the boot and luggage. Personally I would own the new Sportage sooner than the likes of the new Hyundai Tucson (a review of which is coming soon) as I feel it’s a better looking vehicle and a nicer place to be inside with a slightly better driving experience, in saying that though, if the dealer were going to be getting my hard earned, the new Kia Sorento is what I would go for due to that extra space inside as well as the chunkier exterior.